Having worked with dozens of beverage companies over the years, I’ve learned that a mixture of different vehicle programs is common. Some provide company-owned/leased fleet vehicles, and others reimburse employees for the use of their personal automobiles. One of the most common approaches to reimbursing employees is using a car allowance – generally, a monthly flat amount (e.g. $500) intended to cover the employee’s operating costs. While easy to administer, car allowances are wrought with disadvantages, most notably, the tax obligations to both the organization and its employees. Flat car allowances are popular because they’re simple to understand and easy to report to the IRS. They are fixed amounts paid to drivers each month, intended to compensate for the business use of personal vehicles. With a flat allowance, you have predictable vehicle expenses each month and can even incentivize desirable employees by offering a high allowance as a sort of salary bump. The disadvantage comes at tax time. When your vehicle reimbursement isn’t tied to actual driver costs, it is considered a “non-accountable plan,” which incurs taxes just like any other form of compensation, such as salary. This means the allowance is subject to FICA taxes for businesses and both FICA taxes and income taxes for employees. Taking it down to the numbers, let’s say, for example, that you’re offering drivers a flat monthly car allowance of $300. Your business needs to factor in FICA taxes, which means you’re actually paying a total of $322.95 per month, per employee. Assuming the employee is in a 25 percent income tax bracket, after contributing to FICA, they will take home only $202. Adding it all up, that’s roughly $121 per month, per employee lost to tax waste. The best way to avoid this tax waste is to implement accurate mileage reimbursement through a fixed and variable rate (FAVR) program, the IRS’ only recommended reimbursement methodology. Since it accounts for actual costs, FAVR reimbursements are non-taxable. This means, in the example above, you would save around $1,451 in tax waste each year, for each employee. 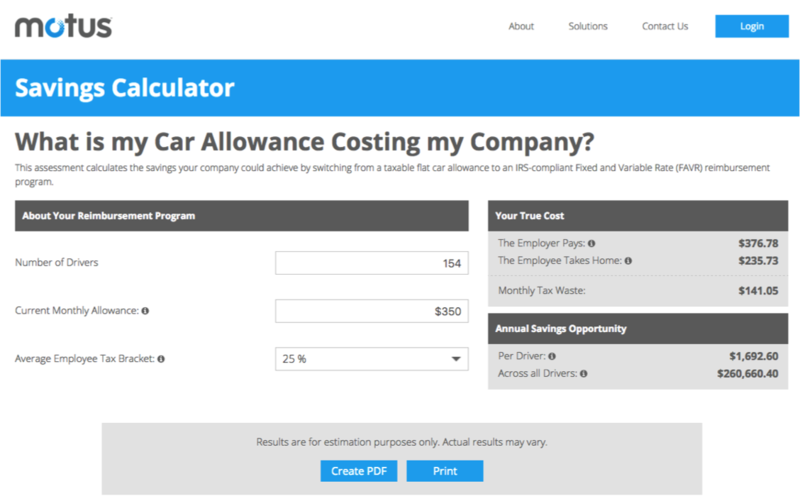 If you’re interested in exploring how your company’s costs would be impacted with FAVR vs. a flat car allowance, Motus provides a free analysis tool. With large sums on the line for both employers and their employees, it’s certainly worth it for beverage companies to take a closer look at FAVR before the next tax season.